Philip Levine, former Mayor of Miami Beach. “Fighting for the real needs of the working families of Florida.” Boston-born, two-term mayor and 40-year resident of Miami. Jeff Greene, real estate entrepreneur. “A different kind of governor for Florida.” A self-made Harvard graduate raised in a Massachusetts working class family. Gwen Graham, former Congresswoman of Florida’s Second District. “It’s time for government to care about people again.” Attorney, wife, mother, and daughter of former Gov. Bob Graham. Andrew Gillum, Mayor of Tallahassee. “Rebuild Florida into a state that works for all of us.” Miami-born, with 15 years of public service, and the first in his family to graduate from college. Chris King, Winter Park businessman. “Ready to bring results and reform to the Sunshine State.” An Orlando-born, third generation Floridian, and a Harvard graduate. 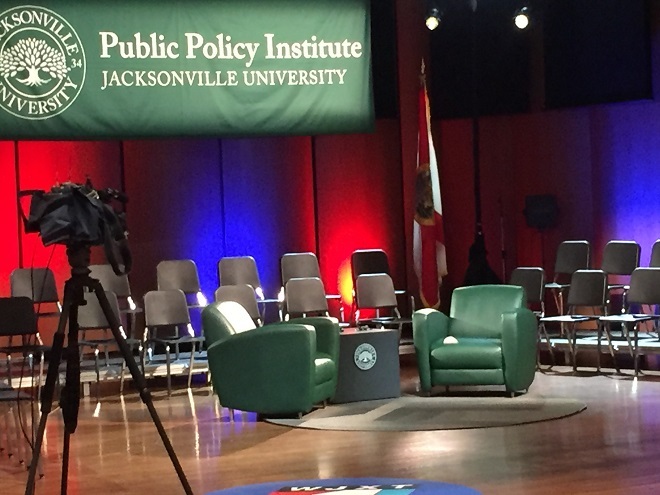 Kent Justice, once again, served as moderator, and Director of the Jacksonville University Public Policy Institute (Institute) Rick Mullaney welcomed guests. 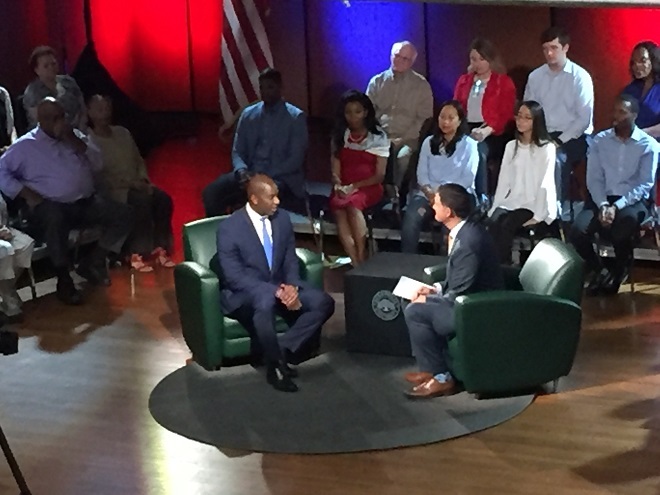 In a one-on-one conversational format, all five candidates had less than 10 minutes to delve into priorities and answer pre-selected questions. 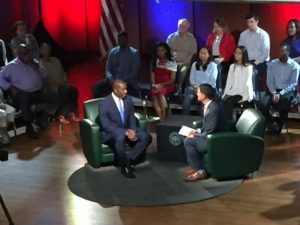 Surrounded by high school, undergraduate, and graduate students of all ages on the Terry Concert Hall stage, candidates addressed a talkative and relaxed audience. Blue suits, ties, T-shirts, jackets and pins were in abundance. Many top issues discussed were common ground for Democrats, including minimum wage, toxic algae blooms, school security, sea level rise, banning assault weapons, not raising taxes, and, as expected, a shared anti-Trump stance. Where each candidate differed was on topics such as decriminalizing marijuana, competitive teacher pay, mandatory Pre-K, sanctuary cities and dreamers (DACA), single-payer and public option health insurance, the death penalty, and private prisons. 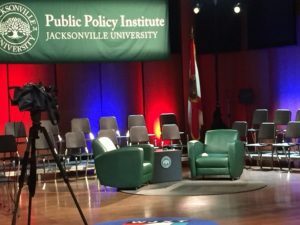 On the heels of hosting a final debate between Republican gubernatorial candidates Adam Putnam and Ron DeSantis, guests once again flocked to Jacksonville University (JU). The first in the state of Florida to offer a Master of Public Policy (MPP) degree program, the Institute is now in its sixth year. 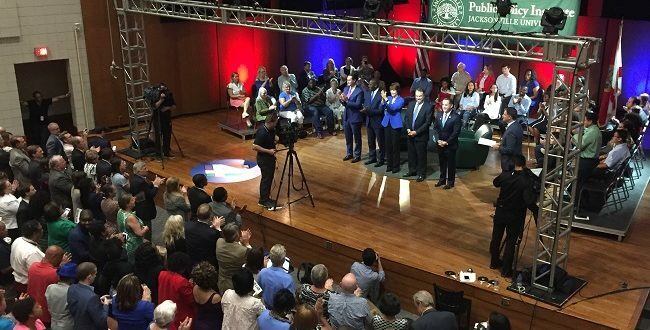 A regular host to VIP speakers, elected officials, and Jacksonville leaders, the Institute prioritizes meaningful nonpartisan discussion on substantive issues. Many elected and former officials in attendance tonight served as guest teachers and speakers at the Institute in recent years. MPP students Connor Coleman, Marcus Benjamin, Steve McInall, Roger Palmer, and Laurel Wainwright attended the back-to-back events. They were joined by members of the Institute’s newest cohort Jacob Bianchi, Jenna Blyler, Richard Carbonell, Justin Cox, and Maurice Wallace. Each of these graduate students participate in a wide variety of public events, lecture series, and policy courses. Included in their studies is the development of core skills in policy analysis, quantitative methods, management, government, critical thinking, legal processes, political science, public finance, ethics, communications, and leadership. Each MPP student also completes a Capstone project on a current policy issue, like many of those discussed tonight. JU is the oldest and largest private masters university in north Florida and south Georgia. The University actively seeks world-shapers, innovators, collaborators, frontrunners, risk-takers, and pacesetters. The Institute supports the mission of the University by helping to shape the future of public policy by preparing a new generation of leaders and providing a neutral gathering place for public policy discussion, education, and debate. Follow the Institute on Instagram, Facebook and Twitter, where you’ll find live updates on the biggest events. Search “public policy” for more in-depth coverage from WAVE magazine.